Summertime: It is summer in the US and the global warming chorus is in full voice. As explained by Tim Ball linked in last week’s TWTW, the Rossby waves associated with the circumpolar vortex and jet streams have become very pronounced. This results in a blocking – slower movement of pressure systems from west to east. A high pressure system is stalled over the eastern US, resulting in a series of hot days. This is similar to what happened in Russia in 2010. As was the case in 2010, the chorus is blaming global warming / climate change with prophesies that this is the future if carbon dioxide emissions continue. In the winter of 2010, the chorus called the unusual cold as normal weather change. And the members of the chorus wonder why the public is becoming increasingly skeptical towards global warming / climate change. Although it has been hot for some, the actual data does not confirm that June was unusually hot. As a side note, the hot days in the East came immediately after a derecho knocked out electricity for over one million people, in some cases for over a week. In the Mid-Atlantic States, a summertime high pressure system results in little air movement – insufficient to generate electricity from wind turbines. So we may be experiencing the future if those who demand solar and wind power are politically successful. Forest Fires: The forest fires in Colorado have been unusually severe. According to a Washington Post article, the Undersecretary of Agriculture who oversees the Forest Service blames these fires on global warming / climate change. At the request of Gordon Fulks, professional forestry consultant Mike Dubrasich prepared an essay on Pine Beetles, Fire, and Global Warming. The temperature trend in the Rockies is one of cooling, not warming. The destruction of the forests is more a result of Forest Service (environmental) mismanagement, than any other single factor. Nature can be a brutal manager of natural assets. In 1988, when the Park Service set controlled burns that ran out of control and burnt over one-third of the forests in Yellowstone, it did not have global warming / climate change to hide behind. Please see Article #1 and links under Communicating Better to the Public – Exaggerate, or be Vague? Transparency: The Royal Society Report suggesting that both data and codes should be archived is a positive step, but will such a proposal be enforced by government funding agencies? Steve McIntyre states that track record of the US National Science Foundation is very uneven. This is inexcusable. The funds used are public money. There are no national security issues in making climate science transparent. As seen with the hockey-stick, studies must be reproducible if they are to be accepted. On a similar issue, Chris Horner of the American Tradition Institute reports that during their efforts to have public records released under the Freedom of Information Act (FOIA), a significant element has appeared. The Union of Concerned Scientists (UCS) is organizing efforts to resist FOIA requests for some but not for all. Please see links under Climategate Continued. Does the dog of Anthony Watts, a member of UCS, have any comments? IPCC: Rajendra Pachauri, the chairman of the Intergovernmental Panel for Climate Change (IPCC), has made it clear that the IPCC is a political pressure group, not a scientific organization. He has called for the general public to support IPCC claims in order to bypass governments that do not fully accept them. This comes after announcements that lead authors will not be selected by merit alone, but by geographical preferences, and that the IPCC will accept grey literature, such as articles by environmental groups, which it did in the last report but claimed it did not. What this will do to the claims that only accepted climate scientists can understand climate science remains to be seen. Please see links under Expanding the Orthodoxy. Australia: July 1 marked the implementation of a carbon tax in Australia, something which the Prime Minister Gillard asserted would not happen if she is elected. Please see links under Cap-and-Trade and Carbon Taxes. Nobel Conference: A conference of Nobel laureates became unsettling to some when Ivar Giaever gave his talk, The Strange Case of Global Warming. One could quibble if there has been cooling over the past 15 years, but certainly there has not been a warming trend as forecast by the models. Please see links under Challenging the Orthodoxy. Oil Prices: An article in the Financial Post (Canada) gives estimates of the cost of production for various countries and situations. The precision of the numbers is unrealistic, but the order is important. For example, it costs about $22 to produce a barrel of oil in Saudi Arabia, $43 in Libya, $59 in the Bakken Formation in the US, $62 in the deepwater of the Gulf of Mexico, $66 off Norway, and $87 in Venezuela (heavy oil). Canadian oil sands may range from $55 to $108, depending on the methods of extraction. This is useful, but not complete. The article takes the analysis one step further – what do various nations, with state controlled companies need to meet their budget goals? This can range from $55 in Kuwait, $78 in Saudi Arabia, $116 in Russia to a high of $127 in Bahrain. If the numbers are reasonably close, then many countries cannot afford low oil prices. Please see links under Energy Issues – General. Green Jobs: Last week, TWTW linked to a study for US House Committee on Energy and Commerce that reported that the $8 Billion in subsidies given to solar and wind industry under Section 1603 directly produced about 910 jobs on an annual basis for the life of the systems. This is far below that promised. The Bureau of Labor Statistics has no precise classification of a green job, so even bus drivers are counted as indirect green jobs, rendering the concept meaningless. But this does not explain why job creation from building wind farms is not occurring as promised. Most jobs for wind farms are temporary construction jobs and few are long term. Further, the promised general prosperity is not materializing. A major problem is incomplete Keynesian analysis. Usually, only the impact of the construction phase is emphasized, and what happens when the construction phase is over is not carefully analyzed. A simple explanation is in order. Suppose a government wishes to spend a 100 million of its currency to stimulate the economy. It has three alternative projects, all of which are heavily loaded in construction with little long term costs thereafter and all produce roughly the same indirect effects. One alternative is building a hydroelectric dam to provide electricity where there is none. A second alternative is to build a monument, say a pyramid in the desert. And the third alternative is to build wind farms to replace coal-fired power plants with mandates to utilities to buy the electricity from wind farms as the highest priority. The last alternative describes what many Western countries are doing. After construction, the hydroelectric dam will provide low cost electric power to those who do not have it and will become a positive asset to the region. After construction, the pyramid becomes economically neutral; it may or may not attract tourists. After construction, the wind farms become an economic liability to the region, an economic drain. Wind farms become an economic drain because wind is unreliable and the wind farms require extensive back-up on order for electric utilities to supply reliable power. Contrary to initial expectations that the need for back-up will diminish as wind supplies a greater percent of the power, experience in a number of countries shows that the need for back-up does not diminish. Wind farms may be required for 80 to 100% of the installed capacity of the wind. The coal plants are not replaced and utilities will be forced to charge customers for two electricity production systems. Businesses will face increasing costs and households, with higher utility bills, will face a reduction of their disposable income and a lower standard of living. The above is very simplistic, but illustrates that not all government spending increases the general prosperity of the region or the nation. Number of the Week: 32%. According to the US Energy Information Administration, in April, almost equal amounts of electricity were produced using coal and natural gas, each accounting for 32% of electricity generation in the nation. This is a one-month statistic and will not necessarily hold for the entire year. However, the trend is clear. Thanks to hydraulic fracturing, natural gas is plentiful and prices are very low. Utilities can afford to burn it. In the late 1970s, it was so scarce that the US government outlawed its use as a boiler fuel. As late as 2008, natural was use to generate 21% and coal 48% of US electricity. We are in an energy revolution that has defied regulators. No wonder many in Washington are determined to regulate hydraulic fracturing. As a side note, some analysts are projecting that by year end US carbon dioxide emissions will decline to where they were in 1990, without direct regulation. The sharp recession and prolonged, slow recovery are a major influence on the decline of emissions, but the energy revolution is as well. Today, unemployment continues at an unusually high at 8.2%. The U-6, which includes those who have given up looking for work and those working part-time who wish for a full time job, stands at 14.8%. Please see links under Oil and Natural Gas – the Future or the Past? Next year comes the federal deluge. The Higgs boson breakthrough marks a beginning, not an end. What is timely to recall, however, is the admission made to MPs in March 2010 by Professor Julia Slingo, the Met Office’s chief scientist, that the “numerical models” used by the Met Office to make its short-term weather forecasts are exactly the same as those “we use for our climate prediction work”. Solar subsidies cost German consumers billions of dollars a year and are widely regarded as inefficient. Even environmentalists are concerned that Berlin’s focus on solar comes at the detriment of other renewables. But the solar industry has a powerful lobby, and politicians have proven powerless to resist. In Colorado wildfires, ‘worst in state history’, why won’t the Forest Service use the biggest firefighting tool available? How would you lead us out of the climate predicament? Our only option is to lead from below. What would you do to achieve the fastest, greatest progress in the fight against climate change? Is there a derecho in here? Weather from before coal fired power stations — shock — not perfect? German solar bubble? Look again! Reference: Bergholt, D. and Lujala, P. 2012. Climate-related natural disasters, economic growth, and armed civil conflict. Journal of Peace Research 49: 147-162. Reference: Koubi, V., Bernauer, T., Kalbhenn, A. and Spilker, G. 2012. Climate variability, economic growth, and civil conflict. Journal of Peace Research 49: 113-127. Reference: Moazami-Goudarzi, M. and Colman, B. 2012. Changes in carbon uptake mechanisms in two green marine algae by reduced seawater pH. Journal of Experimental Marine Biology and Ecology 413: 94-99. With Moazami-Goudarzi and Colman determining that S. minor and S. cylindricus “were able to tolerate a broad range of pH from pH 5.0 to 9.5,” as well as the broad range of salinities they investigated, it would appear that even the worst nightmare of the world’s climate alarmists would not be a great impediment to the continued wellbeing of these two green marine algae, even without the positive influence of evolutionary forces that would likely come into play over the timespan involved in the seawater transformations envisioned by Caldeira and Wickett. Reference:Caldwell, G.S., Fitzer, S., Gillespie, C.S., Pickavance, G., Turnbull, E. and Bentley, M.G. 2011. Ocean acidification takes sperm back in time. Invertebrate Reproduction and Development 55: 217-221. ← Why the U.S East Coast heatwave was not unusual nor the number of record temperatures unprecedented. In England it was colder than normal in May, in June it was colder than normal, in July so far it is colder than normal and predicted to stay that way into August. Sometimes I just hope and pray that there was a shred of truth in gobal warming. To Old England: Thank your global warming “experts”…. thermometer is just hanging upside down…..
I’m getting a 403 error on that Giaever link and now on the Jonova site saying I don’t have permission. Very odd indeed. O/T I’m also getting a “Forbidden” message on Jo Nova’s site. My guess is she’s having tech problems again (I hope that’s all it is). 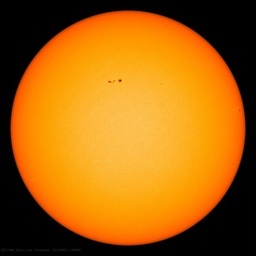 Its worth mentioning again that Prof Mike Lockwood, who is not a sceptic, said two years ago that such pronounced blocking is linked with solar minima. And we’re in the weakest solar cycle for arguably a couple centuries. Hard to tell whether this is the cause or a contributer to this particular heatwave event, but it is evidence diametrically opposed to the CAGW wolf criers of the last few weeks. Breaking news: CERN scientists today revealed that they could finally announce with 5-sigma certainty the discovery of the ‘lost’ Thompson climate data. “We have been running our giant ATLAS detector for months now,” said one physicist “and found it needed some fresh wiring in one component. In the cupboard next to the toolbox was a stack of papers marked ‘property of Lonnie and Ellen – do not distribute’. This is a far more surprising discovery than the Higgs, and opens up whole new possibilities for science…”. Climatists of global warming alarmism essentially have given up pretending that they can use science to make their case against Western industrial man; they’ve given up on reason. The climatism of the weather fearmongers has evolved to the point now where it has the credibility of earthquake prediction science. The official `science’ of the global warming alarmist community is simply to pray for catastrophe and then point. The only real `consensus’ that exists, now that Bush is gone, is to simply blame capitalism whatever Nature brings our way. See! Carbon tax *IS* working. Regarding the Colorado fires. Can you provide a link for the mentioned cooling trend experienced in the Colorado Rockies? From the above mentioned the huge amount of data, one can not conclude that is known what is the main cause of global warming or climate change. This means that for that reason absolutely knows the science nor the individual scientist. In the race for prestige and knowledge in property, people have lost their orientation and relationship with its natural eternal, and changing laws. The main causes of change are forces in the system. Mutual relations between them depend on the movement and position of celestial bodies, which groups depends on the cycle of their intimate relationship. The concentration of forces causing increased motion of the core body heat, which causes all the other changes: electro-magnetic fields, vortices in the masses, the vacuum in the shift of nuclei, which causes the reverse effect of pressure and mass ejection, and again this phenomenon in many other physical chemical changes . Let’s start this way, I have some evidence about the 11 year sunspot cycles. For now, I do not have sufficient conditions for publication without contractual obligations. Edit: “Wind farms may be required for 80 to 100% of the installed capacity of the wind. ” — nonsensical. Perhaps “Backup may be required for 80 to 100% of the installed capacity of the wind farms.” ?? “Nature can be a brutal manager of natural assets. In 1988, when the Park Service set controlled burns that ran out of control and burnt over one-third of the forests in Yellowstone, it did not have global warming / climate change to hide behind.” Nature took the opportunity to play catch-up for all the years of saving up ground fuel prior to 1988 — and burned it all at once. Very inconsiderate! .But hardly unexpected, except by the weak of mind. I was impressed over the weekend by Alexandra Steele (now CNN, formerly Weather Channel) who was baited by the news announcer to do a climate change diatribe but refused to take the bait. Natural gas fracking is capitulation to the greenies. If we put the General Welfare of human beings first, nuclear power with the full fuel cycle would be the keystone of our national energy supply strategy, while research would be directed at several approaches to fusion, including the fusion-fission hybrid. Fracking lowers the cost of natural gas extraction, but at the expense of underground water quality. Oil, gas and water have a natural tendency to separate when not disturbed; fracking forces them to mix; it is a far more disruptive way to mine oil and gas than drilling. This would be acceptable if we had no alternative other than to die for lack of energy, but we have an alternative and have had it for nearly 70 years, but we’ve let the greenies sabotage it until they’ve convinced us that it’s more expensive, despite a 3 million-to-1 energy density advantage over coal by weight, and even better by volume! Old England: The Guardian ran a good article on the weird English weather, and current meteorology theories linking it to changes in the jet stream caused by the loss of Arctic ice. We may have permanently disrupted our weather systems. You may have to start either getting used to it and live with the deterioration it causes to your life. Or if it gets worse, well, we’ll remember the English as some of the first casualties in the upcoming series of planetary changes. LONDON: Large wind farms might have a warming effect on the local climate, research in the United States showed on Sunday, casting a shadow over the long-term sustainability of wind power.